2.2 Single Or Multiple Serve? 2.3 Paper Filters Or Reusable Ones? Pour over coffee is a specialised technique of preparing coffee which is quite different from instant coffee making, and prepared in a diligent way. If “Pour Over Coffee” is a term you have never heard before, probably you are yet to be a connoisseur of coffee. It can take you by surprise how a little alteration in the method of brewing can make a big change to your coffee’s taste. This would include the minor changes in the temperature of the coffee, the amount of water to coffee in the mixture, how you clean your filter before using it and the speed. Coffee brewed in best pour over coffee maker tastes just like a cup of good hot coffee but it helps you have more control over it while preparing as compared to a classic drip coffee maker. It is important to note that how good your coffee tastes will entirely depend on how well you grind the coffee beans. So you could very well buy a good coffee grinder along with the pour over coffee maker if you want, such as a burr grinder that grinds your coffee beans uniformly. In this article, we share with you the 7 best pour over coffee makers in the market that can help you brew the best coffee in a simple and beautiful way. This easy to control and use coffee dripper allows you to control the time of brewing and temperature of water with ease, along with control over the flow of water. This helps you to control the way you want your coffee to taste like. You have the option to choose from four choices – ceramic, plastic, glass, and metal and it further comes with a range of colour options. 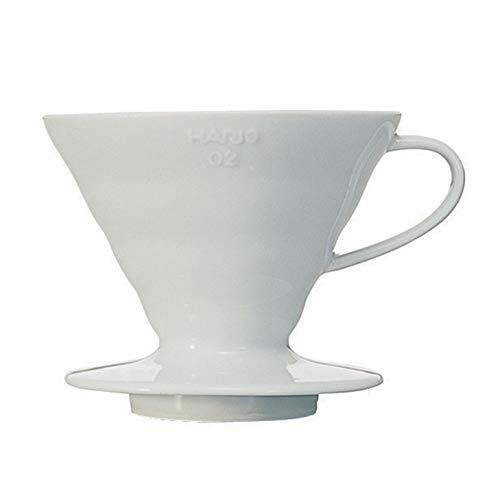 Overall, this model from Hario is the finest in our list and is also one of the most affordable ones. Verdict: The Hario V60 is best for those coffee lovers who love brewing their own coffee and wants the perfect taste to suit them, along with their choice of grind and temperature. Sturdy built up and sleek design. Customise it according to your taste. This pour over coffee maker is one of the most premium one in our list and comes with a beautiful design and is ideal for beginners as well. The design of this coffee dripper is unique in the sense that it comes with a wave design and a flat bottom to ease your process of filtering. There are three holes in the dripping system that are combined together to help you brew fine coffee. Brewing coffee with this dripper is not a hard task at all. 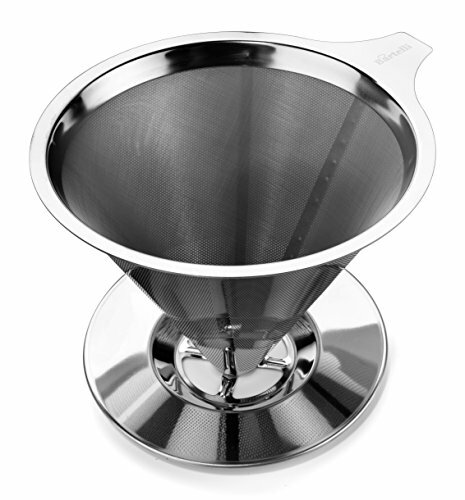 You only need to grind your coffee and put in inside the machine and this sturdy dripper will do the rest for you. You have the option to choose from three variants – glass, ceramic, steel depending on your choice of medium. Comparatively, this is the cheapest model in our list and fret not, you are assured of great tasting coffee every time you brew with it. It is so easy to use that even a beginner barista can you use without any fear and trouble. 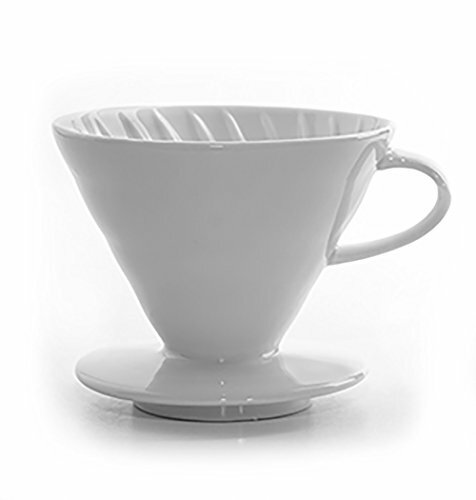 Verdict: Kalita Wave 185 dripper is ideal for beginners, professionals and experts alike. Your experience in coffee making will not come in the way of you enjoying a good cup of coffee every time you brew with this coffee maker. Good coffee brew irrespective of your experience in coffee making. Great in design and ease of brewing. If you are looking to brew rich in taste and robust in smell coffee, the Bodum 11571-01US is ideal for you. This coffee maker helps you retain the natural oil of your coffee grounds thus giving you a strong taste of it every time you enjoy your coffee. It is a multi-serving dripper and can serve up to 34oz per pot. This is helpful for those who drink more than a cup or two per day and fret over the need to put grind over and over again to keep brewing coffee through the day. The one major reason for its demand in the market is because of its ease of use. You only need to add coffee grounds inside it and then pour water over it in circular motion in a way that all the grounds are soaked well and then pour the rest of the water over it. Within a few minutes, your cup of coffee will be ready to be enjoyed! 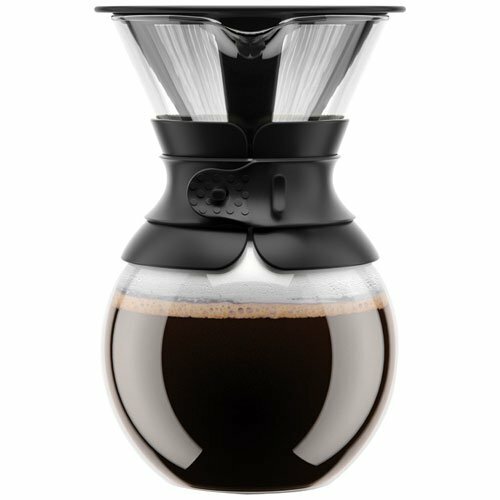 Verdict: This model from Bodum is ideal for those who want to enjoy coffee in larger quantity without having to worry about adding coffee grounds every time. This is one high quality pour over coffee maker that is excellent in quality and design, allowing you to brew perfect coffee every time you use it. Bartelli is a renowned brand in the world of coffee drippers. You don’t need to purchase extra paper filter when you are using this product, without the fear of losing the flavour of the coffee grounds while brewing. The filter comes with tiny holes to make sure that the grounds don’t fall over the cup, no matter how much coffee grounds you put in it. The dripper has been designed in a way that it is ideal for single serve as well as for carafes. However, to extract the best flavour from your coffee grounds, it is advisable to use it for making one or two cups at one time. Verdict: If you would not mind spending some extra amount on a good quality coffee dripper without compromising on the taste of good coffee, this model from Bartelli is an ideal choice for you. No need to purchase extra paper filters. You can use it in a dishwasher to clean it. Osaka coffee maker products are built in a way that you get a great coffee experience every time you brew coffee in it. All the products are mostly sleek in design and is great in terms of performance as well. With an Osaka Pour Over Coffee Maker, you can brew up to 6 cups of coffee at one time. The carafe is made of glass which is also thermal allowing you to keep your coffee warm for a long period of time. You won’t have any bitter taste coming from your coffee and it is also both microwave and dishwasher friendly. The glass carafe which is also thermal has a heat-resistant collar to help you pour coffee in the cup directly from the carafe, without the use of a cloth or towel to prevent your hand from burning. The price of this coffee dripper is slightly higher than all the other products on this list but it is worth every penny. Verdict: This product is ideal for almost anyone who would not mind spending some extra money on a premium to allow them to brew excellent tasting coffee and is ideal for larger families. 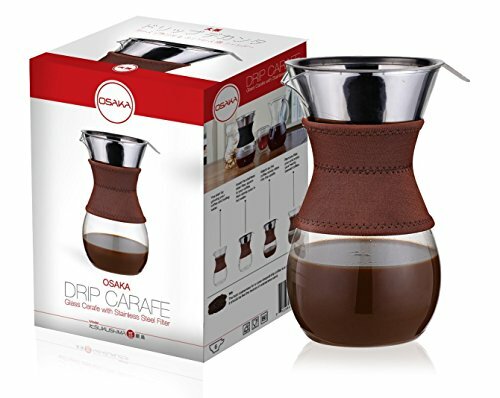 The carafe comes with a heat resistant collar to keep your hands safe when pouring coffee. It is sleek in design. You can brew close to 6 cups at one time. 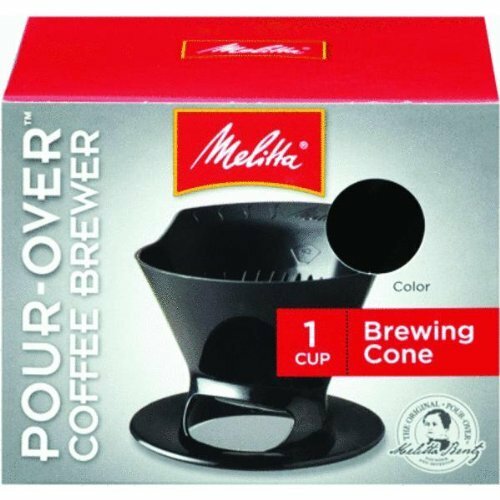 The Melitta 64007B is a single cup coffee filter cone that is not very beautiful in its design but is extremely easy to clean, and maintain. It is also within budget and is the most affordable in our list. It is ideal to be used at home, with smaller families. The design is simple and you wouldn’t even have to fret over assembling it or disassembling it when cleaning it. Furthermore, it is dishwasher safe and the process of cleaning it is quick. You do not need to buy extra paper filters with this product. The price of this product is so affordable that even college going kids can afford to buy it. Verdict: If you are looking for a valuable coffee maker that is rightly within budget for you then go for this pour over coffee maker. 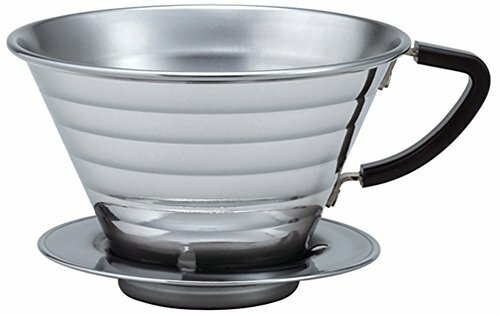 Cheapest pour over coffee maker in the list, even cheaper than a cup of coffee in an expensive coffee outlet. Ease of use, cleaning and maintenance. Ideal for small families, but makes lip-smacking coffee. The Tanors Ceramic Coffee Dripper helps you make coffee in a way that you can have complete control over the brewing process. You will realise that the brewing process is a form of art for you, with this coffee dripper! The ceramic element in it allows your coffee dripper to control the heat even while you are brewing it. You can even touch the handle without the fear of burning your hand. The dripper has been designed in a way that when water flows through it, it will evenly flow through the coffee grounds soaking the grounds in an even manner. It has large extraction holes allowing you to control the speed of brewing so as to bring out a robust aroma and a strong taste of the coffee grounds. Verdict: It is for those who are have used a coffee machine like this before and have a knowledge of the brewing process and how the taste will come out to be. Makes strong coffee with robust aroma. If you are someone who loves to brew coffee and have a good enough knowledge about the process of brewing, then the process of error and trial won’t be a long one for you. But if you are a beginner it will be vice versa for you. So likewise choose a pour over coffee maker depending on how much you know about the process of coffee brewing to have smooth brewing and drinking experiences. If you want to buy a coffee maker only to brew coffee for yourself or maybe just one or two members in your family then a single serve will suffice for the purpose, but if you want a coffee maker to brew you coffee for the entire day or for a larger family go for a multi-serve coffee maker to ensure that it is a hassle-free experience through the day. Paper Filters Or Reusable Ones? Paper filters can become expensive over time for you if you end up buying them on regular intervals. But if you do not want to go through the process of taking hassle of cleaning, than paper filters are good to go. However, having said that, reusable filters are ideal for providing good tasting coffee as they retain the natural oils of the coffee grounds. Last but not the least is your budget constraints. Set a budget before you plan to purchase a coffee machine to ensure that you do not end up wasting time in looking for coffee makers beyond your expected quote. Make sure that the coffee grounds you use are fresh and in the right quantity to retain the robust aroma and flavour of the coffee grounds. Ensure that you grind your coffee only immediately before use and not a long time before it. If you keep your coffee grounded before to save time, it will lose the flavour. Hence it is ideal to ground them minutes before brewing. Premium roast that is, usually darker and oiler is better than coarser grind if you want to retain the flavour of the coffee ground. This is even more important for those who enjoy strong coffee with robust aroma. Read the manual carefully before using the coffee machine, no matter how experienced you are at the process of coffee brewing. Don’t fall for cheap paper filters just because the price is low. Bad quality paper filters will hold the good flavour of the coffee grounds and won’t make your coffee taste as good as it should be. Pour over coffee makers are great for those who like the authentic smell of coffee and love to enjoy brewing their own coffee. All homes who love coffee should definitely have one pour over coffee maker! Pour over coffee makers are great to use and beautiful in their design to offer you delicate and fully flavoured coffee everytime you brew coffee in them. Needless to say they are easy to use and are quick as well. You can have full control over your coffee extraction as well. There are plenty of ways of brewing coffee but having the best pour over coffee maker will make the task extremely smooth and easy going for you.